AY-3-8912 for the Coleco ADAM..? Hmm, I seem to be posting a lot for a confirmed lurker... I promise I'll stop soon. I mentioned on the other thread I started that I was looking in to doing an AY sound chip upgrade for the ADAM. 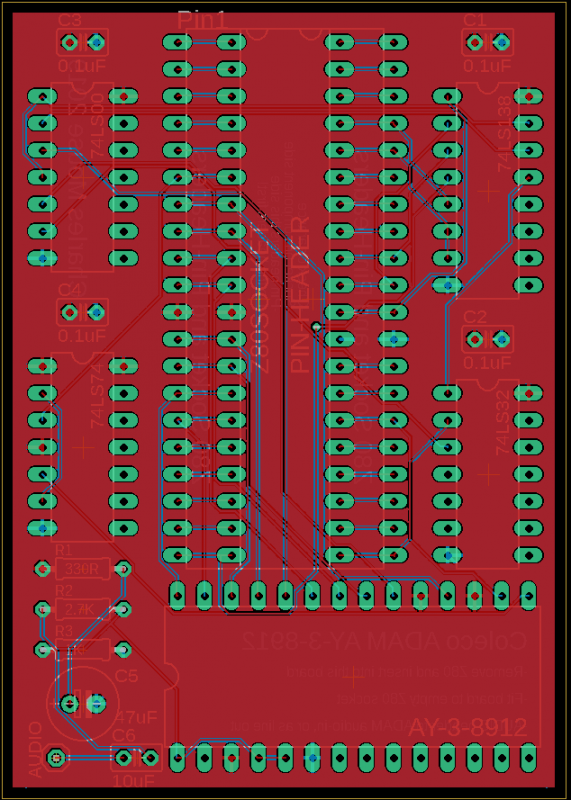 With these thoughts in mind I decided to leave the expansion port alone and see if I could make a board that would fit in place of the Z80 as (nearly) all the required lines should be there and DIL-40 sockets aren't exactly rare. 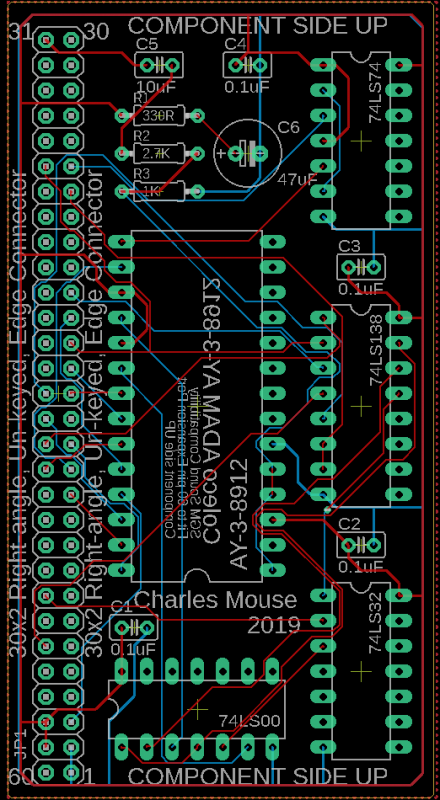 The only required line that I'm aware is missing at the Z80 is the Audio-in to be found on Pin 31 of the expansion connector, so that will have to be a flying lead - either to be soldered somewhere suitable or as a separate line-out. ...um, I'm also very new to the ADAM so the schematic may have some serious errors. I'd welcome advice and suggestions if anyone has them to share. If you wanted to do this internally, depending on what expansion cards you have you may be able to do it through one of the internal slots. Yep, using an expansion slot would be an easier upgrade and if there's a general wish among others for me to go that route I certainly can... I do this stuff largely for my own amusement but if my 'designs' prove useful to others I'm always pleased and so am happy to take suggestions. -Oh, Having actually measured I'll likely need to re-do the above layout as it will interfere with a bunch of passives SW of the Z80. Either that or it's board re-work time as well as socketing the CPU. Not a biggie, but the above layout came together so well it's a shame to abandon it. Um, while we're on the subject of proper expansion slots does anyone have the pin-outs for J5 and J6..? As far as I can tell the TRM lists the signals but not the pins and I'm not sure I wholly trust/understand the schematic I have. a) Does anyone have access to the schematics / gerbers / system files required to DIY one? b) I know d*mn-all about the Ti9918 and as I'm asking questions, and lazy, does anyone know how 'compatible' the later (Yamaha) versions are? Edited by CharlesMouse, Tue Mar 19, 2019 12:48 PM. They are "reasonably" compatible from a software interface only... pinouts are different and normally they host more than 16k of RAM (but it looks like 16k is legal). Software that uses undefined register bits tends to have problems (and in the TI world, we found there was more than we expected). Most stuff will likely work out of the box. Not all ADAMs are created equal and can play SGM games sans AY sound output without the Opcode SGM connected. I have one that will and one that won't. You're probably busy, not lazy. Edited by mr_me, Wed Mar 20, 2019 3:24 AM. 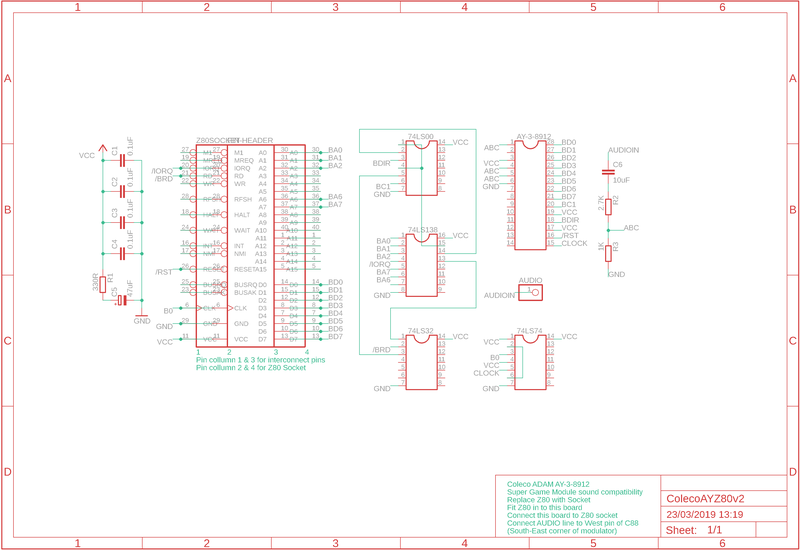 A while back I was starting to do schematic capture for a Yamaha 9938/9958 upgrade board. I'd like to do one using SRAM instead of DRAM (using a CPLD to demux the DRAM addressing) to reduce part count and use more modern RAMs. I used to have a TIM board for my ADAM that I scavenged from a TI 99/4A, it worked, mostly. The first hurdle is that you must program the palette registers used by the older video modes as by default all the colors are set to black, so nothing would display. 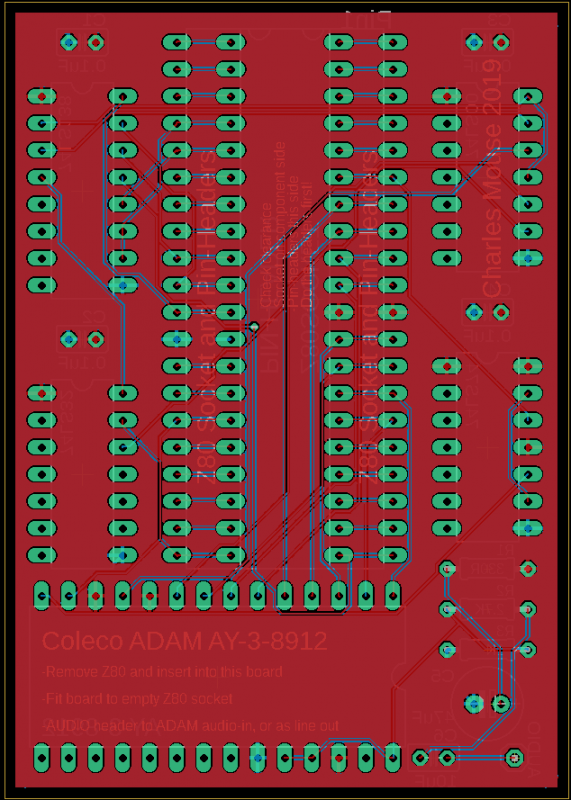 There were some other gotchas, but I like the idea of using a 9938 or 9958 on the ADAM, and I think a DIY project could be pretty inexpensive. I guess that's at least hopeful, I shall have to pull my finger out and take a proper look myself & see if I can do it. 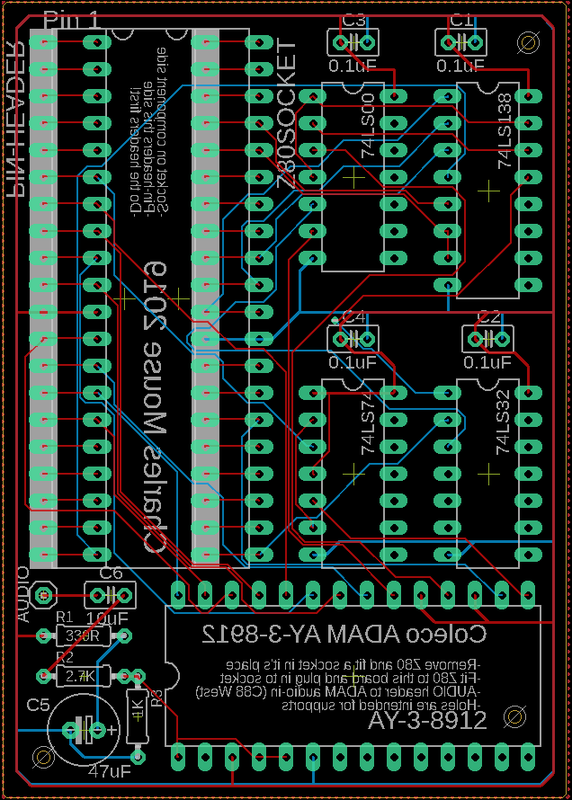 After further measurement my initial take on a Z80-socket AY board won't fit the Delta board of the ADAM without messing about with some caps. I've yet to check clearances in the Colecovision itself as I've just remembered the Expansion Module 3. So I've done an update for that, that will fit and happily the West pin of C88 looks to be a good spot to hook-up the AY's output. 2) It would be easier (but permanent) to first solder my Z80 board's pin-headers to the shoulders of the Z80 and then solder the otherwise completed board to them. I really, really wouldn't do that until I've at least proven this design actually works!!! Yes, the boards have good VCC and GND fills (for two layer boards) but not shown in the images as as not to obscure the traces. Edited by CharlesMouse, Sat Mar 23, 2019 8:41 AM. Don't buy into the rumor mill. I work with the guy who makes them and we talk almost daily about it. V2 is coming. Hobby projects are just subject to real life interference. Thank you very much for the most welcome information. If it's not too cheeky for me to ask would you mind letting the chap who makes these I'd really like one, along with an ADAM adaptor board if the new version requires that, when v2 is out? Many thanks and do please pass on my sincere thanks for his efforts on this excellent project. ...please be advised that if anyone is interested in making their own I would wait until I've reported back to (hopefully) say the design actually works. 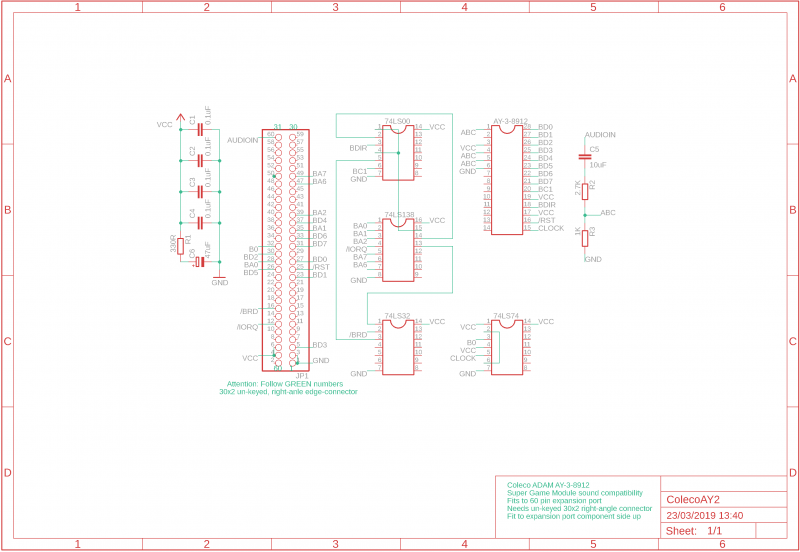 (Seed Studio usually turns jobs around in about 2 weeks) Also while the side-expansion version is all-but identical to the Z80 socket board I've no intention of making one of those myself so any who do go with that one will be using an untested design! Gerbers for both are attached. Thank you again - I have now left a message.